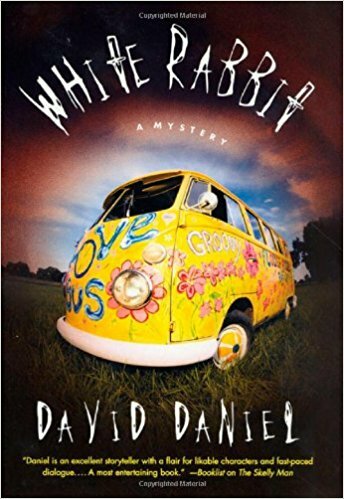 It’s the fiftieth anniversary of the Summer of Love this year, and to celebrate, I thought I’d pick up a mystery and suspense novel that dives right into the heart of the 1960’s: White Rabbit by David Daniel. It was one hell of a trip, blending civil unrest, rock and roll, and the hippie lifestyle with the vibrant San Francisco community, and setting it squarely against an entrenched Establishment that wasn’t particularly interested in equality or upsetting the status quo. Detective John Sparrow is forced into the heart of an explosive atmosphere in pursuit of a killer, as anti-establishment forces start to square off with an increasingly militant police force. As Sparrow descends into the friction between these two warring tribes, he’s forced to confront both a changing San Francisco and the specter of his tortured past, for the last time he was on the hunt, the killer got away. White Rabbit was a real thrill ride, and I had an opportunity to sit down with this master of mystery and suspense and pick his brain about what went into this fantastic (and psychedelic) suspense novel. Q: The 1960’s were a time of coming of age in many ways, as young people were shedding the naïveté of an earlier generation, for better or worse. How did your own coming of age experiences help you create White Rabbit? There was a notion afoot that idealism and “love” and righteous rage could turn the wheel of history. We were reacting to what we saw as the complacency, the conformity that had settled over America in the two decades following WW2. In context—given the turbulence and dislocations of that war—it was understandable, at first. But in time, the consumerism, racism, sexism, the degrading of the environment, the loss of spirit, became real problems in America. The big uniter of people by the mid-1960s, however, the pole around which so much else revolved, was the war in Viet Nam. Less than twenty years after WW2 and we were back at it again. What that provided was something tangible to rally around and push back against. By the late 60s, all but the most ardent and misguided saw that the war was a futile effort on a grand scale. And lives were being lost daily. In Southeast Asia, certainly, but here at home too. Of course, as often happens in the throes of youthful idealism, it proved to be we who were naïve, not yet wise enough to grok that the world is a complicated place. But the fact remains… the war was brought to an end, Nixon resigned in shame, etc. Admittedly, there was some bad fallout from that period—the drug culture most notably—but there was far more good. The then nascent women’s, civil rights, and environmental movements have become world concerns. That’s nothing to feel bad about. Q: Your hero, Detective John Sparrow, is drawn steadily into a world that is colliding with his own, and calling to task his own set of values, as he pursues a serial killer scarred by experiences in Viet Nam. Given that you were a soldier and a child of the 1960’s, can you talk about how that informed White Rabbit? I wrestled with that… I didn’t want the antagonist to be just another embattled vet . . . my empathies with vets were strong, and that seemed too simplistic. And yet there was metaphoric weight to it. One of the ways I chose to represent that character on the page was through a 2nd person point of view, which was at odds with the 3rd person narrative of the rest of the book. My period as a soldier was a schizoid one. It caused fractures in my psyche that I didn’t realize at the time. I don’t claim to have had full blown PTSD after I got out—my army experience was very limited—but I did fall into a rabbit hole, so to speak. And as much as I railed against the army, I have found it creep into my work at various junctures. I’ve a whole group of stories that deal with the military in one form or other. And some of my oldest, dearest friendships were forged in the military. Q: In many ways, you’ve drawn upon two different worlds—two entirely different perspectives—in White Rabbit; one represents the establishment, while the other represents change. Can you speak to that? How has that changed in the modern era? That’s a perceptive comment. We’re seeing it writ large on the national stage right now. I think if anything good comes out of this misbegotten Trump presidency, it will be a reminder that we’re all swimmers in the same global sea. We will sink or float together. Fiction has a role to play in this, as a reminder of what we hold dear and in common. Q: The no-nonsense, young reporter Amy Cole seems to represent a sort of middle ground between the civil rights movement and the establishment as they begin to clash. She tries to maintain a reporter’s objectivity. How did you walk the middle ground during this time period? Or did you? I’m not sure I did. I tried. As I said, those were schizoid times. By day I was a reporter for the army . . . my stories appeared in various publications . . . The Armored Sentinel, Stars and Stripes, Army Times . . . some of the features even wound up in major national newspapers. By night, when I wasn’t getting high with my buddies, I was off post with some of those same friends, hanging out at a coffee shop and, under a pseudonym, writing poems, fictions, letters that had a decidedly subversive slant. But we all managed. Ft. Hood was affectionately known as Ft. Head. Q: How has your perspective changed between the 1960’s and now? What do you think about what’s going on today? I’m savvier now—if only because I’m older. But as for my views . . . I grew up with the notion—which in my mind has never wavered—that liberal thinking, in the broadest sense of that word, is the only thing that has ever led to positive change in the world. Conservative thinking, while not without merits, mostly on the fiscal matters—is almost always a dead end. It breathes the meager air of illusion, the myth that things were once better than they are. Voltaire reminded us two and a half centuries ago—as Jesus and Buddha did long before that—that this world, as it changes day by day into the future, is the best of all possible worlds. Q: Without giving too much away, the killer in White Rabbit—the Death Tripper—is a product of the sins of the establishment, as well as his own upbringing. Can you speak to that? Ha ha. Aren’t we all? But, yeah. There’s a sense in the story that the wages of too rigid a belief system can be death. We see that in spades now, here and abroad. Extremism, of any stripe, is always a kind of death. Q: Is there anything else you’d like to add? The book had a nice ride . . . and earned some notice that I’m proud of. I like to think that a hundred years from now, if someone wants to know what that moment in time and space felt like, reading White Rabbit could give them a pretty good idea. I think the publisher (and I) failed in going with a small font . . . but the publisher wanted to keep it uncut and it was going to be long. The typed manuscript was some 800 double spaced pages. But on an e-reader that’s not an issue. One thing that I did—as a kind of personal literary touch—aware that almost no one would even notice, is the first word of the book is “Ending” and the last word—some many thousands of words later is “beginning.” Making it, in effect, a kind of literary Mobius strip. I liked bookending it that way . . . it suggested, to me, at least, that something was ending with the era and something else was beginning. I think that may be happening again now. 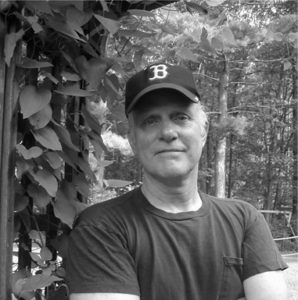 David Daniel has published a dozen novels and 200 short stories. Among his books are Reunion, White Rabbit, and The Marble Kite. Recent short fiction can be found in the anthology Insanity Tales III ; in Sleet; and in Zombie Logic Review . David, congratulation on your latest book. Sounds very inviting. Hope to see you at our 55th reunion.